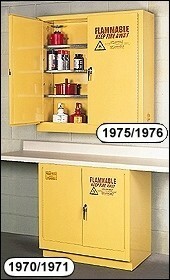 Under counter flammable material storage cabinets are space savers. They utilize the often unused space under counters. Additional storage without taking up other valuable floor space. In most cases they fit well under counters, fume hoods or under windows. Optimize your work areas with this compact cabinet. These flammable material storage cabinets come in two door self-closing and manual models. Did you know the number one cause of commercial fires is the improper storage and handling of flammable material? Our flammable material storage cabinets makes protecting your facilities from fire easy. Are your flammables and combustibles materials stored in safety storage cabinets? Here is a link to OSHA 29 CFR 1910.106 and Uniform Fire Code 79.202 regulations. You can easily comply with these regulations with cabinets. Constructed to the same high quality specifications as our floor model safety cabinets that include these 14 standard features. Click on the features link to see the quality. These under counter flammable material cabinets meet NFPA Code 30 and OSHA requirements. Use under counters or windows. Flammable material cabinets at discount prices. Dimensions o/s - 35" x 22" x 35"